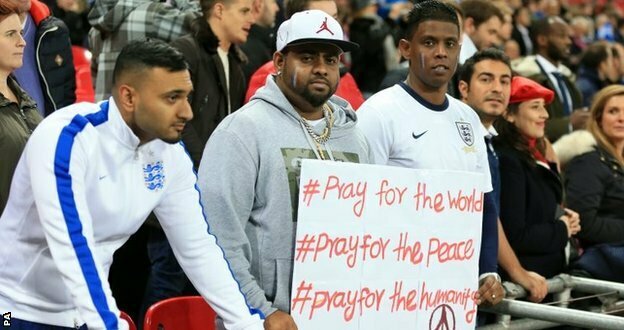 England and France paid tribute to the 129 people killed in Friday’s attacks in Paris at an international friendly at Wembley on Tuesday. A crowd of more than 70,000 sang La Marseillaise – the French national anthem – with the Duke of Cambridge and Prime Minister David Cameron present. France’s game with Germany at the Stade de France was targeted in the attacks. But France chose to go ahead with Tuesday’s game, which ended 2-0 to England, amid heightened security. Before kick-off, flowers were laid at the side of the pitch by Prince William and the opposing managers, England’s Roy Hodgson and Didier Deschamps of France. 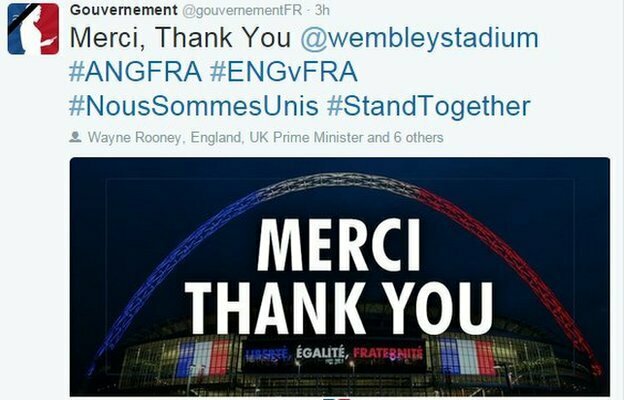 The Football Association (FA) had encouraged England supporters to learn the words to La Marseillaise in a show of solidarity and Wembley’s arch was lit up in the blue, white and red of the French flag. Applause greeted the end of the anthems before a minute’s silence was impeccably observed, with one side of the London stadium creating a Tricolor mosaic with coloured cards. As the final seconds were played out, France’s fans delivered a final rendition of La Marseillaise, which drew loud applause from England supporters. A Belgian citizen has been identified as the mastermind of Friday’s deadly attacks, and Belgium’s friendly with Spain on Tuesday in Brussels was called off because of security fears. Meanwhile, Germany’s match against the Netherlands in Hannover was cancelled about an hour before kick-off. The stadium was evacuated and supporters sent home because of a “concrete security threat” and “plans for an explosion”, according to police. French security sources say that surveillance video shows a possible ninth assailant during the attacks – which have been claimed by the so-called Islamic State (IS) group. French Football Federation president Noel le Graet turned down the FA’s offer to cancel the match and FA chief executive Martin Glenn said the game would have “massive global significance”. “It was a spine-tingling moment as fans within Wembley rose as one to sing La Marseillaise. “Some of the French players were close to being overwhelmed with emotion. Prince William, president of the FA, decided to attend the match after Friday’s attacks. London mayor Boris Johnson was also at Wembley. England captain Rooney said: “It was always going to be a difficult night for everyone, especially the French players and staff. “For ourselves to be involved in this occasion was tough, the young players were excited but it was a difficult game for them. I thought both teams handled it extremely well. The fans were brilliant. France and Tottenham goalkeeper Hugo Lloris said: “First of all we want to thank all the England people in the stadium for their respect. Marseille midfielder Lassana Diarra – whose cousin was killed during the attacks – came on as a substitute to a standing ovation. “England fans in the home end held up coloured cards to form a human flag of the Tricolor. Most joined in La Marseillaise, stumbling over the words but singing loudly. One French fan, who was at the Stade de France on Friday, told BBC News: “Everyone’s a bit afraid of leaving the house now, but you have to keep living your life and lots of people are in shock. 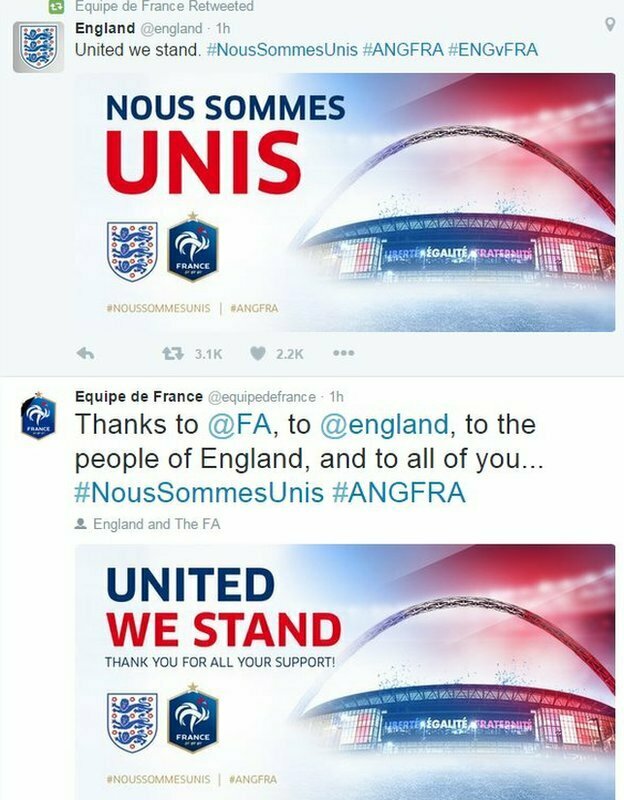 Manchester City’s France midfielder Samir Nasri also tweeted: “Not talking football, let’s appreciate the respect the English have shown”.